I have come to adore floral scents as I’ve gotten older, and I’ll tell you a secret… I used to despise them! I think it was a mental block because of some of the horrible, cheap floral candles I had been exposed to early on in my candle-sniffing journey. Once I decided to venture on out of my comfort zone, I discovered a wealth of floral scents that not only I could tolerate, but that I could actually ENJOY! I was so pleased when my friend, Christina, asked me to review this Honeysuckle Jasmine candle from Madison Valley Candles. A new company to me and a great-sounding floral mix – score! As I mentioned, Madison Valley Candles is a new company to me. Among other things, they create 100% soy wax candles, and their company has grown exponentially since starting in 2004. I was super excited when my candle arrived in the mail. It was a huge jar (26 ounces) and it was topped by a classy, wooden lid. The jar itself had a huge label on it, identifying the company and scent names, as well as a few other details. I think the label could be removed if you wanted, but it wouldn’t be a super easy task. The wax was a pretty bright yellow – perfect for Spring! This candle had two wicks, which is exactly what I prefer for this size candle. The wicks were well placed, so no issues there. The wax had the typical soy wax appearance. My candle was dyed yellow, which went well with the scent. I see on the website, however, you can choose from an array of colors for any scent. This is fantastic in case you are trying to match with some particular décor. WHAT DID MY HONEYSUCKLE JASMINE CANDLE SMELL LIKE? Although I do have a love of floral candles now, I do have to be careful as some of them bring on migraines for me. No fun at all! I had to take a light whiff of this candle to see where it was going to fall for me. One whiff and I was hooked! This was a beautiful smelling floral, mostly honeysuckle on cold sniff. The floral was not “too floral” for me – it was just right. Although I didn’t get that particular jasmine scent on cold sniff, I knew I wasn’t smelling pure honeysuckle. It was a beautiful blend of honeysuckle plus. I could hardly wait to start burning this one. I lit it in my living area, which is a large, open space. I took off to do some not-so-fun chores, when about 30 minutes later I began to smell it. H-O-N-E-Y-S-U-C-K-L-E!!! Oh my word! I am a Southern gal born and raised, and this scent brought back so many pleasant memories for me. 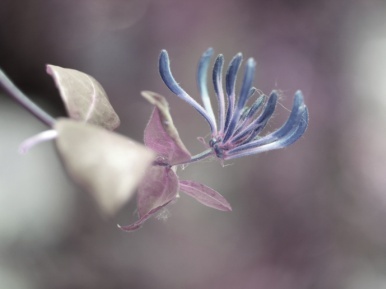 The sweetness of honeysuckle is fairly distinctive, and I found this scent to be true. Pure honeysuckle scents *can* become too much even for this Southern belle, which is why I suppose this particular scent is mixed with jasmine. Again, I couldn’t pick out the jasmine exactly, but I could tell something was rounding the sweet, floraly honeysuckle. There was and added warmth and depth to the overall scent, which I really appreciated. As far as scent strength? This baby was strong. Really room-filling strong. Not so strong to run me out of the house, but I could certainly smell it all throughout the front part of my home. I’m glad I chose to burn this out in the open space – I think this size candle in this strength would be too much for me in a bathroom or even my bedroom. I was able to get a full wax melt pool in a relatively short period of time with this candle. The candle melt pool was fairly thin, but it didn’t prevent this beauty from pushing out the scent. I didn’t have any trouble with the wicks or any noticeable sooting. It burned evenly for hours on end, with no wasted wax on the sides. Perfect! 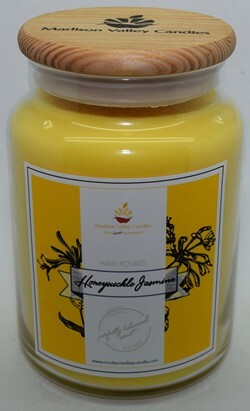 Honeysuckle Jasmine is listed as one of Madison Valley Candles’ best sellers. I can certainly see why! I’m not going to sugar coat it – you *do* have to like florals to enjoy this scent. But then again, I would expect only die-hard floral lovers would be seeking out a scent such as this in the first place. I’m certainly sold on it, and I can’t wait to try more from Madison Valley Candles – floral and more!